1340 MARINA WAY S., RICHMOND, CA 94804. PLEASE FOLLOW THESE WRITTEN DIRECTIONS BELOW IF USING THE APPLE MAP APP TO GET TO THE CORRECT SIDE OF THE MARINA! Driving on 580 West take Exit 10A for Marina Bay Parkway, S. 23rd St. Turn left onto 23rd St. (which becomes Marina Bay Parkway when you cross over the freeway). Turn right onto Regatta Blvd. Turn left onto S. Marina Way. Turn left onto Hall Ave.
Hall Ave. dead ends at the Harbor Master’s Building (it looks like a school house with a blue roof). PARKING - There is a pay parking lot ($12.00) on the left. The lot on your right is FREE PARKING. Park in the lot on your right - in the spaces with signs reading "Marina Bay Yacht Harbor Parking" or "Public Shore Access Parking". On weekends you can also park in school assigned spots. 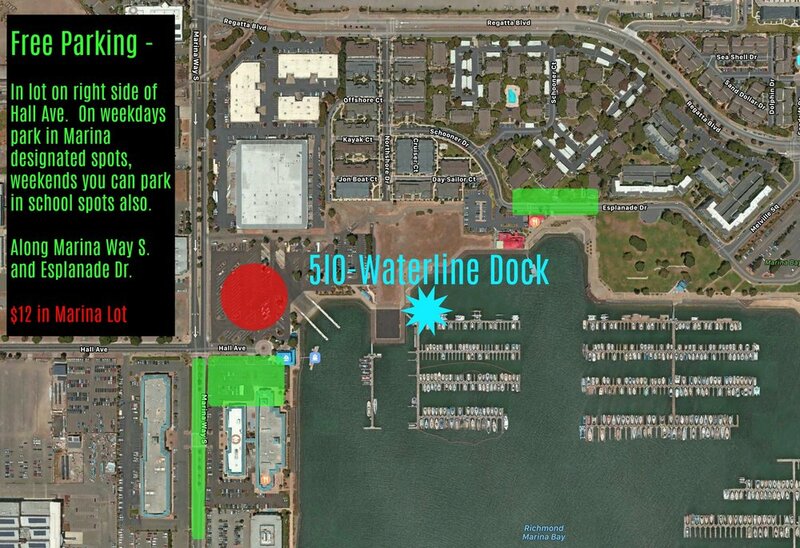 There is also free street parking along Marina Way S. and Esplanade Dr. - see map below. From free paring lot - once parked, walk East. At the water turn left, walk past the public boat launch, keep going on the bay trail until you see a gated entrance marked F-Dock. We will meet you there. Driving on 580 East take Exit 10A for Marina Bay Parkway, S. 23rd St. Turn right onto Marina Bay Pkwy.